VIP Private Tour departing from Chiang Mai and Chiang Rai, Thailand. Private wine tour to Mae Chan highland vineyards to observe the process of pruning, cultivating, planting, harvesting, and nurturing grapes that produce award winning wines. 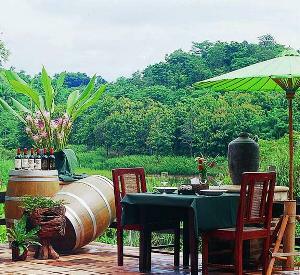 Explore Mae Chan vineyard and winery followed by a wine tasting of the Chateau D' Mae Chan Thai wines. Next is the Gem Cutting Village where you can experience the lapidary, the process of cutting and polishing gems. Then continue with the breathtaking scenery of the terraces lined with tea plantations. After spending time in the tea plantation, you can stop by the factory to see the process of making tea. Also, you can enjoy tasting Oo-Long tea in the teashops and shopping for some of their Chinese teapots sets as souvenirs. Presentation on the Chateau D' Mae Chan Thai wines. Tour includes modern transportation, driver, fuel, parking, guide, vineyard tour, Winery Tour, lunch, Chateau D' Mae Chan Wine tasting, wine presentation, tea plantation tour, tea tasting, and gem factory tour. 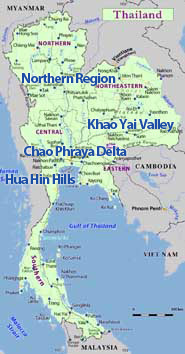 Mae Chan Valley is located in Amphoe Maechan, Chiang Rai, Northern Thailand. It is surrounded with beautiful atmosphere of vineyard, tropical trees and plants and a lake which you will cross on your trip to the winery and vineyards. Mae Chan Winery select and plant the highest quality Shiraz wine grapes imported from Australia for making the Thai red wine. Mae Chan Winery red wine have received "the Best of the Best of Chiang Rai" recognition from wine critiques. Mae Chan Winery Shiraz is grown on the hillside vineyard in Chiang Rai Province in the northern part of Thailand. 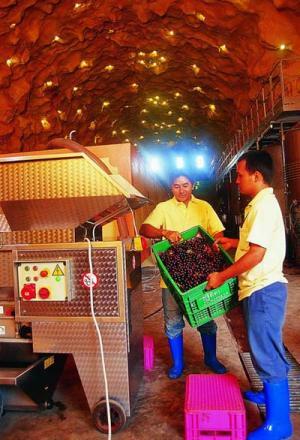 To create the full-bodied red wine, Mae Chan Winery selected the best cuvee from the two-year harvests. Through aging in oak barrels, Mae Chan wine has a unique character. It has an attractive red color, elegant aromas and soft balance of flavors. Beautiful natural surroundings and a year-round perfect temperature in Mae Chan Valley create an impressive location and makes for a great Private Day Tour to the winery. The breathtaking view of vineyards, tea plantations, rice fields, and the serene lake is a perfect place for a day tour, lunch and wine tasting. Take a vineyard and winery tour with us, you will enjoy spending your time discovering new amazing experiences such as seeing the process of planting and caring for high quality grapes, wine making, Thai wine tasting of Chateau D' Mae Chan and other activities. Here is your opportunity to view Chiang Rai, and experience the most unique and exciting moments of your life. Join our private tour in an amazing journey to explore the Mae Chan vineyard and winery, tea plantation, gem cutting factory, rice field, organic garden, and nursery plants at Mae Chan Valley, Chiang Rai.